My friends, Marita and Marijke, are keen cross-stitchers (although Marijke has recently converted to become a keen hand quilter!!). They have made beautiful pieces that I always admire. 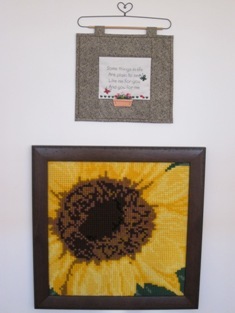 Last December (2010), I went shopping in Valkenburg (The Netherlands) with Marijke and bought two cross stitch kits of my favourtie flowers; Sunflower and Tulips. 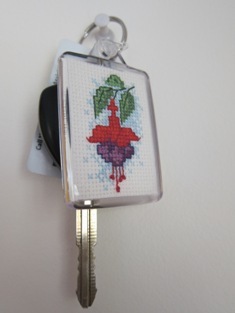 I determined to finish them for my birthday this year (May 2011), and stitching them in between my other sewing projects, I did. I was pleased with myself. :-) ... During my stay in France, I have decided to work on and finish off some cross stitch kits that I started a few years ago but didn't quite get around to finish them. I'm now a proud owner of a 'special' car keyring. Fuchsia always reminds me of my wonderful trip to the south of Ireland. 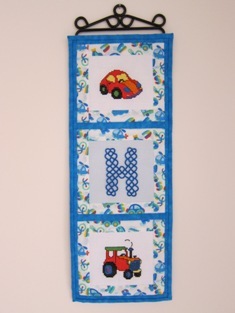 Also, together with a tatted letter H, I have made a wall hanging for my son, Harrison, from two of the finished cross stitch pieces. 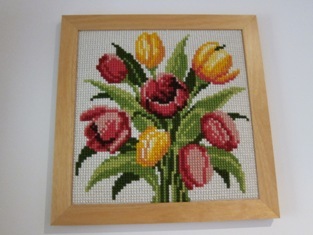 I still have more cross stitch kits to work on, enough to last me my life time, I think.!! I find the stitiching relaxing and, now and then, it's a nice break from the sewing machine to be sitting quietly in my rocking chair in the morning sun while I work on a kit.